They are the forgotten combatants of a forgotten war. But local historians are trying to change that in Somerset County. A group of about 15 people formed a caravan on the day before Memorial Day to pay tribute at one cemetery after another to the men who fought in the War of 1812. The informal procession braved biting deer flies as it hopscotched among five burial grounds around the marshy southern end of the county. The ceremonies were nearly identical to those staged last year on the day before Veterans Day. At that time, the Somerset County Historical Society focused its first round of tributes on men buried at three cemeteries in Princess Anne. At each burial site, historian Sean O’Rourke read each veteran’s name, and one volunteer from the crowd stooped to plant a 15-starred American flag in the rain-softened dirt. 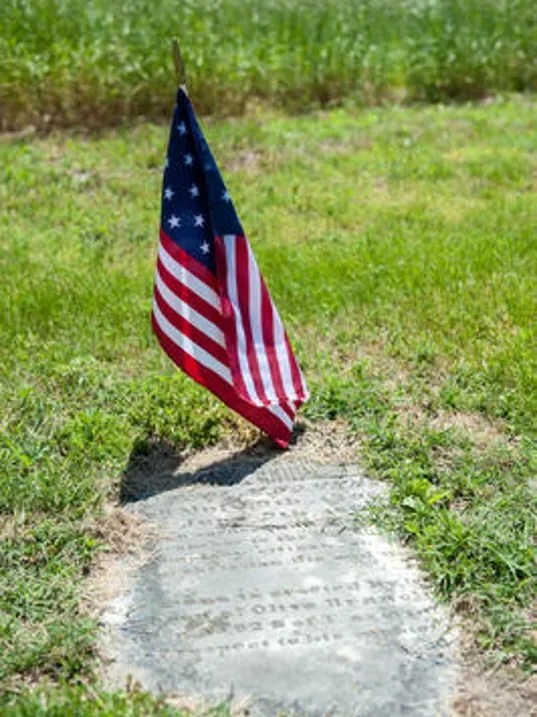 Driven by the war’s bicentennial anniversary, O’Rourke has spent the past few years determining the final resting places of the war’s veterans around Somerset. And he has expanded the list of known sites from a mere handful to around 80, he said. He hopes such tributes continue past 2015, the 200th anniversary of the last year of the war. The ceremonies Sunday honored men ranging from privates to a general — though Robert Jenkins Henry, who is buried at Coventry Episcopal Cemetery in Rehobeth, wouldn’t achieve that rank until after the war. The events, now in their second year, highlight not only the men, but also the region’s role in the pivotal war, said Warner Sumpter, chairman of the Somerset County War of 1812 Committee. Many local troops enlisted in the military and fought in battles far from the Eastern Shore. But the region saw bloodshed of its own. British troops bivouacked at Tangier and Smith islands. For those troops, Somerset County would serve as a “refrigerate,” Sumpter said. Their barges would float up rivers and creeks in search of food and supplies to sustain their 26,000 at the ready to leap at Baltimore and Washington, D.C.
Members of the militia, once alerted to such threats, would respond. Sometimes, they arrived in time to ward off the intruders; sometimes not, Sumpter said.